Coverage: Live on BBC One, live commentary on Radio 5 live sports extra, BBC Radio Ulster and BBC Sport website and BBC Sport app, plus live text commentary. 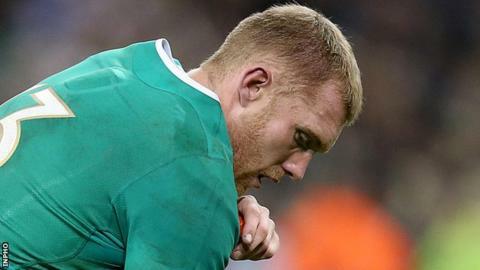 Keith Earls could play in Ireland's Six Nations game against France on Saturday as he continues to recover from a suspected concussion sustained in the 16-16 draw with Wales in Dublin. The indications from the Ireland training camp were positive on Tuesday, although Fergus McFadden has joined the squad as cover for the Munster man. Rob Kearney and Sean O'Brien are set to be fit to return against the French. Mike Ross and Cian Healy are likely to make their comebacks with Leinster. Both props are set to feature in the Pro12 fixture against Zebre on Friday night, with neither part of the Ireland squad at the moment. Ross has overcome a hamstring complaint while Healy is on the verge of a playing return after knee trouble. With Marty Moore ruled out of the tournament with a hamstring strain, Nathan White and Tadhg Furlong look set to hold down the tight-head side of the scrum. Earls, 28, is going through the return to play protocols at the Ireland base at Carton House. "Keith feels pretty good himself but a six-day turnaround - we will just have to assess that later in the week and see where he is at," said Ireland assistant coach Richie Murphy. "We are squeezed for time but no player is going to be ruled out yet." Leinster pair Kearney and O'Brien have returned to training as their recoveries near conclusion, and both are in line to make comebacks this week after missing the Wales game with hamstring injuries. Flanker Tommy O'Donnell passed a head injury assessment and took a full part in Tuesday's workout in Kildare. Johnny Sexton did not participate in the session because of a shoulder injury but the fly-half is expected to train on Thursday. Simon Zebo (knee) and Andrew Trimble (shoulder) also sat out training but should be back in action on Thursday.